Today I received an email from a professor at Fairleigh Dickenson University, a composer, asking me if I would be interested in taking a look at some of his recent compositions for clarinet. I just resigned from two different community colleges as the Adjunct Clarinet Instructor, but he sent this email to my direct email address, and it wasn’t flagged as coming through my website either. I think I may have the actual email address written out on my website somewhere, so he could have just copied it rather than linking to it. I never attended or taught at or that close to that University, nor do I have any connections at that University. I have NO idea how he found me. It is times like these that make me feel semi-famous in my little music world. To know that I was scouted out in some way, that my opinion matters in the clarinet and University/Professional level composer world means something to me. I know I will never be the principal of the New York Philharmonic, or a big shot soloist. I made the decision a long time ago while I was still in college and met my to be husband that I wanted a family and I knew that meant I would need to make sacrifices in my career. Right now I’m still not quite where I want to be, especially recently because my husband has had to take 2 full time jobs to help us out financially which has meant that I have even had to turn down some gig opportunities because I need someone home with our 10 year old, and I don’t have many sitter options. I am hoping that as she gets older and within the next few years when she is able to start staying home by herself at night as well that I am able to start taking and seeking out more gig opportunities again. I miss playing more. I still perform, but hardly anywhere near what I used to, and even then it wasn’t as much as I had wanted to. I am 40. I’m getting up there in terms of music career to be feeling like I haven’t even really broken in the way that I have wanted to. I started a bit later having a kid (I started by raising my older step kids first, so I didn’t have my biological daughter till I was 29). I hope it’s not too late by the time I’m actually able to get myself back out there. The one thing I have going for me that’s unique is that I can play 3 instruments almost equally well, Clarinet (my primary), Flute and Sax. There are people who play all three in order to play pit orchestras, but not many can actually play the level of solo repertoire on all 3 the way that I can. I am able to play a full length solo recital and play all 3 instruments with equivalent level solo material on all 3 instruments, which makes for something that is not really done. So I hope that I am able to begin re-pursuing that in a few years again. Emails like the one I got today are little reminders that my name is out there. People in other states have heard of me. I hope that this will work to my advantage 6 years from now when I really work on becoming famous for real. Fingers crossed. A quartet of dreams, four layers down. A dream within a dream within a dream within a dream. To plant an idea, a thought so deep in someone’s brain that it will permeate like a disease. In my experience, dreams aren’t necessary to do this. Inception within a dream isn’t necessary for what is essentially mind control. Repetition of ideas and thoughts can accomplish this often times, and experiencing emotions at a primal level can also accomplish this as well. There are many ways an idea or thought can take hold, but it is very true that it can be stronger than a virus and more resilient than a parasite. Thoughts and ideas can be more powerful than death. Thoughts and ideas resonate and continue to regenerate and pass down long after the person who first uttered the idea or thought has passed. Quartet for the End of Time. The solo movement for clarinet alone-The Abyss of the Birds. Composed by Oliver Messiaen. This piece is in eight movements. It is scored for Clarinet, Violin, Cello and Piano. This is a very unique pairing of instruments. Messiaen wrote the piece while he was a prisoner in German captivity during the war. The piece was premiered in 1941. It was originally written as a trio and then the piano part was added in, which he played in the premiere. The piece was premiered by himself and his fellow prisoners. The complete work has a duration of approximately 50 minutes. There are separate inscriptions to describe each movement. Some of the movements are for the full quartet, but some of the movements are for different variations of instrumentation within the quartet. The third movement is the Abyss of the Birds, which is the recording above of me performing this movement live at one of my former recitals. I played this movement during a recital that I themed as “Journey through the Woods”. 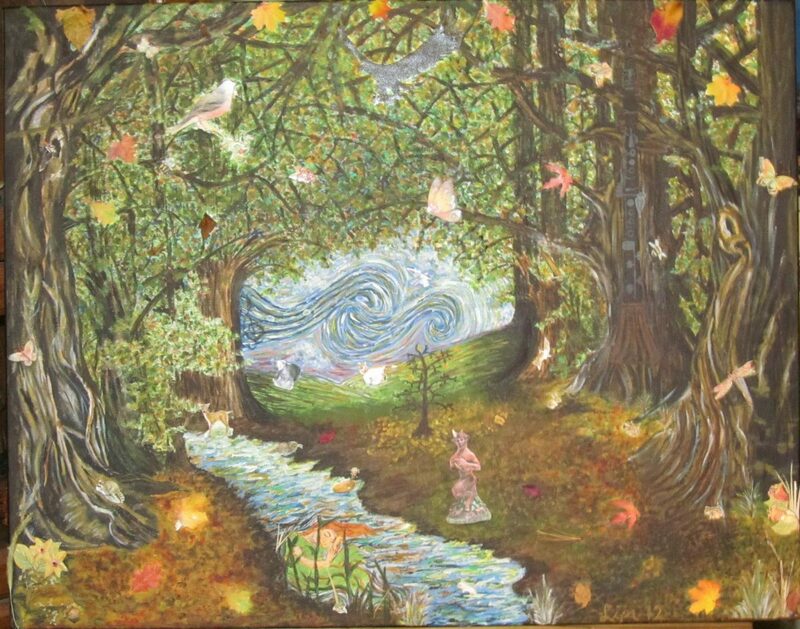 I specifically painted the painting that is on my home page for that recital and I dressed within the theme and had a slide show in the background of Wooded scenes as pictured above. I also wrote a poem and had other poetry read in between pieces. It was a multimedia experience. I was very proud of this recital. It was very stressful putting it all together, but some day I hope to do something like this again, perhaps when my daughter is a bit older and I have a little more time to focus and dedicate the time needed to pull something like that off. Earlier this year, I had a faculty recital performance at the college that I used to teach Adjunct Applied Clarinet Lessons at. I just tendered my resignation this semester for several reasons (all for my own sanity purposes). At any rate, in the past for this faculty recital I had always done a duet with a fellow friend and colleague flutist. Last year I wasn’t able to perform so she had her quartet play. This year I was able to play again and her quartet wanted to play again, but they were short a clarinet player, so I subbed for their missing clarinet player and we all played the recital together. The quartet consists of 2 flutes and 2 clarinets. I had never played in this instrumentation of an ensemble before. It was unique. I enjoyed it, but the other clarinetist and I (who was the leader of the group) had a clash in personalities. So it will be a one time thing. But it was fun to play with a new instrumentation and explore music I had not played before.